Kaja Kamm has been supporting the Social Media Team at SWISS since 2016. Last weekend, she set off on a very special adventure: the legendary Lauberhorn Ski Races in Wengen. With all the equipment and full of excitement, 24-year-old Kaja set off for the Bernese Oberland. Unfortunately, though, the downhill race was cancelled following a heavy snowfall, and the traditional SWISS flypast with the Patrouille Suisse also had to be called off. Read here how Kaja found out, and how her visit still turned out to be a unique experience. The annual Lauberhorn Races have been taking place in Wengen since 1930. They are among the classics of the Alpine Skiing World Cup, and attract countless visitors. In addition to the famous Lauberhorn Downhill, the Super Combination and Slalom, audiences were also to see a fabulous flypast by a SWISS C Series accompanied by the Patrouille Suisse. On 14 January 2017, though, the poor weather conditions put an end to the whole event. The downhill and flypast were cancelled – not that that made the slightest bit of difference to the wonderful atmosphere in Wengen. Kaja starts the day full of expectation. She takes the Wengernalpbahn from Wengen up to the Kleine Scheidegg. "In good weather, you can see the whole mountain panorama," she said with some disappointment. Sadly, though, due to the heavy snow, this view remains hidden today. However, the train ride compensates somewhat with another highlight: the route goes over the tunnel that the ski racers cross on the downhill. "That's so cool!" she exclaims. Once at the top, Kaja is welcomed at the Startbar von Benny empfangen. by Benny, the owner of the bar at the starting gate. From the speakers come hits by the band AC/DC rather than folk songs, and it's not yet clear whether the downhill and the flypast are going to happen. Kaja meets Peter Koch at the Startbar, where he has set up his back office for the flypast. He is a pilot with SWISS, and as Service Director (ground pilot) on the Lauberhorn responsible for assessing the situation in the air. "Peter is on-site with the Patrouille Suisse ground pilot and a meteorologist to check the situation," explains Kaja calmly. Peter will give Kaja the final decision as to whether the flypast will take happen or not. "He's in constant contact with Andres Müller, the Lead Captain in the C Series." Kaja waits in the backroom of the bar with Peter and his wife, where it's a little quieter. "It was almost like being in someone's living room, and we were able to chat in peace," says Kaja. But then came the news: "Due to the poor weather, the Lauberhorn Downhill has been cancelled." It was not possible to postpone the downhill at such short notice. The same applied to the flypast. "The initial disappointment soon passed," says Kaja. "This is where the racers would have started if the Lauberhorn Downhill had taken place," explains Kaja at the Starthaus. The skiers would have covered a route of around 4.5 km, and the maximum speed ever achieved is 161.9 km/h. "That's the highest speed ever recorded in the Alpine World Ski Cup!" Just before the final decision was made, there had been some thought about starting the race further down, either above the Hundschopf or on the Minschkante. "That often happens when the weather conditions aren't good and the wind is too strong," she adds. But then it is far more difficult to prepare the route to the standards required for the race. Time for Kaja to get her skis on. "Somebody did actually ask me if I wanted to ski the Lauberhorn Downhill. I said thanks, but no thanks," she laughs. "The visibility was really poor, so I chose a different route." Kaja skis from the Starthaus down to the Kleine Scheidegg with Peter Koch. "Despite the weather, it was the most amazing fun," she enthuses. When she arrives, she gets on a train down to the Allmend, then continues on the Innerwengen chair lift directly to the SWISS Lounge in the finish area. The SWISS Lounge is particularly well visited today. After all, there is plenty for the viewers to explore. The guests are looked after by Flight Attendants, and can sample meals from SWISS Business and SWISS First that are not being served until March. "And there are also fabulous views of the Zielsack from here." Next stop: World Cup Dörfli. Kaja takes the chair lift back to the Allmend, and from there skis through the village to Wengen. "A fabulous experience! 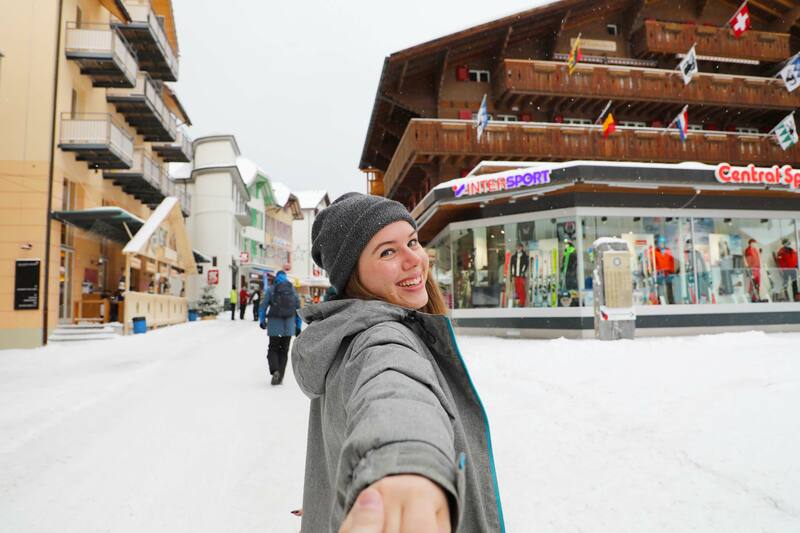 There's nothing quite like exploring the village on skis," she laughs. Now it's time for a little music, and the SWISS Pilot Combo creates quite an atmosphere on the stage! The band has been in existence since 2011, and regularly appears at a wide range of events and venues. The musicians are all SWISS pilots, apart from the two singers. "Wow - they really know what they're doing!" Kaja is full of admiration. The band plays international classics as well as well-known Swiss pop songs. "The place is full of people dancing and having a good time. It's just brilliant!" The Weltcup-Dörfli is full of happy people. The pilots who should have flown the flypast are being interviewed on the stage. "Even though they're haven’t really been the 'Helden der Lüfte', the 'Heroes of the skies' today, the audience was still happy to party with the pilots," Kaja is pleased to report. She is also happy to wind down at the end of the day with "Guggenmusik", mulled wine and a happy ambience: "This experience has been something I will definitely never forget!"